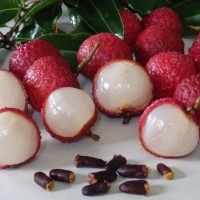 Described as the most luscious of all fruits, the lychee is native to Southern China. 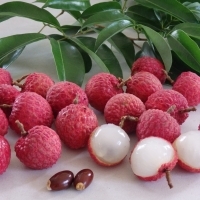 For best results lychee's require seasonal temperature variations, warm humid summers and cool dry winters are the ideal climate for growing lychee's. They are a handsome, dense rounded tree that can be susceptible to damage from strong winds. We strongly advise the purchase of marcotted trees as they bear in as little as 3 years. The varieties below have proven to be some of the best croppers in a subtropical climate. A new variety. Early season, it produces red fruit on an upright tree. Fruits store well and have long shelf life. 30 gm in size. 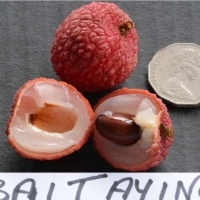 This variety grows up to four times the average size of other lychee varieties with an average weight of 52g per fruit. The exterior of the fruit is dark greenish and red in colour. Excellent quality fruit with sweet, crisp flesh. Early to mid season. A new selection. 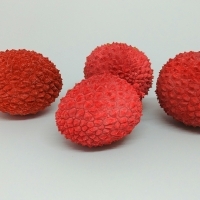 Produces attractive red fruit that are 30g in size. Mid season variety that is a quick growing tree. A new Selection. Attractive pink fruit on a quick growing tree that fruits mid season. The fruits have mostly small seeds. Recently imported Chinese variety - description to follow. 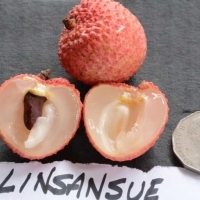 Tree has an open dome shape with excellent quality fruit. Well suited to subtropical conditions. Beautiful coloured fruit with very small seed. Needs protection from wind when young. Fruit at a young age. 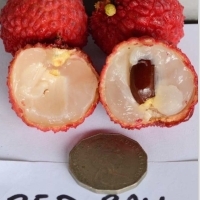 Attractive large red fruit with relatively small seed. Excellent sweet flavour. Mid season, the fruits are about 40g in weight. Fast growing tree. 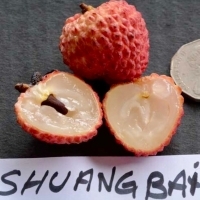 Recently imported chinese variety that will become more widely commercially planted. 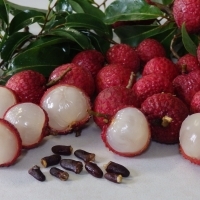 Hardier and easy to grow than a marcotted lychee, seedlings are also a worthy choice for anyone wanting to grow trees for potential selections. 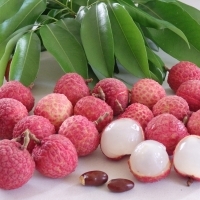 Seedlings have been grown from the popular Kwai Mai Pink and Wai Chee varieties. 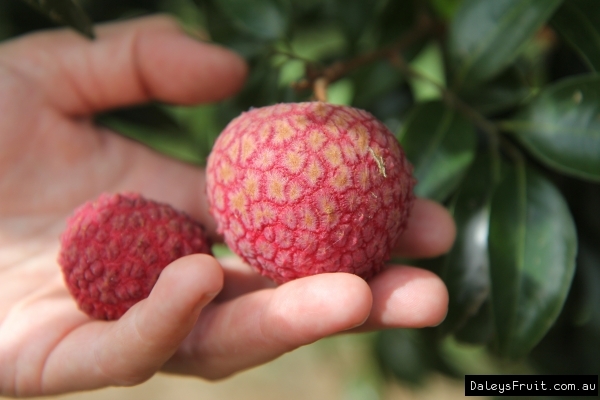 Lychees are slow to grow and need time to mature to size. Seedling are deeper rooted and more stable in the ground so will also be a better choice in high wind areas and marginal climates. Being a seedling they will take longer to come into fruiting. Once they they have reached 2-3m try cincturing to bring them into earlier fruiting. 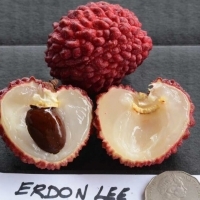 One of the most prized and desired varieties in the world and the leading variety in China. Large red fruits with small seeds, they have clean, dry fruits that are excellent for drying. The trees are harder to grow than other varieties and can be frustratingly slow but with extra care and nurturing they are well worth the effort for the quality of their fruits. Excellent backyard variety. Medium-sized, compact, rounded tree that usually matures fruit from mid- Dec. through Jan. Considered good bearing compared with most other cultivars. Its fruits are large, deep red, and 33-40 to a kilogram, with seeds that are not large in relation to the amount of flesh. A new variety that produces big bunches of attractive red fruit weighing 35 gm. Late season fruit on quick growing tree. Produces high yields at a young age. A new variety, An early season variety with deep red, colourful fruit. 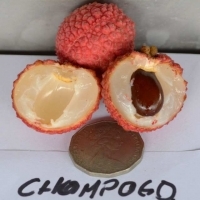 The tree is quick growing and produces fruits that are 30 gm in size.